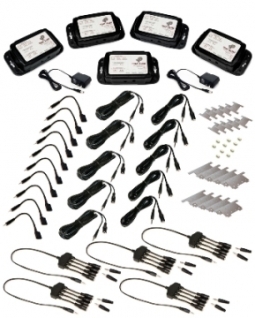 The Trap-Alert™ System 4 Cage Package includes (1) V.4 Unit w/charger, (4) Sensor cables, (1) Expander Cable, (2) 6' Extender Cables, (2) 16' Extender cable, (1) Set of 2 Dummy plugs, (4) Universal Mounting Kit, (4) Magnets (2 per set) and (1) Continuity Tester. The Trap-Alert™ System is a combination of hardware, software, GPS and wireless technologies that enables users to actively monitor the status and location of traps through a web-based application. The Trap-Alert™ System includes the Trap-Alert web application, which significantly increases the efficiency of managing large numbers of traps. Inexpensive sensor kits allow you to easily retrofit your existing cages in advance, making your cages Trap-Alert ready and allowing your traps and devices to be changed out on the job by simply unplugging one device and replacing it with another. Each Trap-Alert™ unit requires a subscription plan that will provide secure account access to the Trap-Alert™ Web Application. This services allows the user to manage the Trap-Alert units, setup personnel and customer communication with any remote email addressable devices (e.g. Smartphones, PDAs, mobile PCs), real time GPS mapping and other administrative tools. Kevin Cornwell, CWCP, ACP, Cornwell's Wildlife Control, LLC, Virgina - The New Frequency Trap-Alert system has changed our business! Our sales closure rate is dramatically higher when we mention an electronic trap monitoring option. It eliminates the hassle of daily visual trap checks, cutting down on wasteful windshield time. Our job completion time has gone from days to, in some cases, just hours. Imagine starting a squirrel family removal job at 9 or 10AM and then getting an email on the IPhone while you’re eating lunch, telling you the job is complete. We did it 11 times last month. Additionally, we saved an apartment complex owner $780 in daily trap check fees while trapping at five of his buildings, even after charging for the use of those five monitoring systems. That savings made him a “forever” customer and freed up time for us, enabling us to start other more profitable jobs. New Frequency’s tech support is superb – better than for any other electronic product I’ve ever owned. At first I was a skeptic, but now I’m a firm believer that Trap-Alert makes us more money than it costs to own and maintain. Eddie & Wanda Hope, Owners/Operators, Virginia Professional Wildlife Removal - Game Changer / Revolutionary. It seems that very few pieces of equipment have come along recently that have had such a positive impact on the nuisance wildlife control industry as has the Trap Alert™ system. Our technicians are notified immediately by email and/or text message when a trap has fired, and the system can be set up to send notifications to our customers as well. TheTrap Alert™ system is easy to set-up and use, and customer support is second-to-none. The Trap Alert™ system helps us plan our daily route, and pays for itself in gas and labor costs. Our customers love the technology. We started with a few units, but now plan to purchase additional units and will eventually make the Trap Alert™ system part of every job. The folks at New Frequency are great to work with. They are constantly seeking feedback from users to make a great product even better. Jeff Davis, Nukingstreet Pest Control, Connecticut - The first time we used the product was for a raccoon job where it took six days for the raccoon to return to the property and make an attempt to go into the open soffits. The job was 43 miles from our office: one way. Trap-Alert saved us from traveling 430 miles to do state required trap checks! We almost paid for one unit with the money saved and earned on the first job! I will be purchasing more units as it will allow me to service more clients without having to hire more employees to just run around and do traps checks! On top of all of that, New Frequency has exceptional customer service! Gary Parks, Backwoods Wildlife Control Texas & Oklahoma - The Trap-Alert system is by far the best trap monitoring system I have found. It saves me time, mileage, headaches and bottom line money. It has set my company apart from all others. I consider the Trap-Alert System a necessity for the modern day Nuisance Wildlife Control Professional.